Hanuman Ji remembered Holy Name and captivated Lord Rama. Meera took the shelter of Raidas. She was a Rajput lady and had worshipped Lord Krishna since childhood, so why did she accept Raidas, who was a low-caste, as her Master? Meera Bai says, "Payo ji maine nam ratan dhan payo. Vastu amolak di mere satguru, kari kripa apnayo." She says, "I have got the jewel of the Name. My Master accepted me as his disciple and imparted the invaluable Spiritual Knowledge to me." Meera accepted Raidas as her Master to know the true name of God, because, even though this Name is present within everyone's heart, no one can know it without the grace of the Spiritual Master. Guru Nanak Dev Ji also says, "Eko sumaro Nanaka, jal thal raha samay. Dooja kahe sumariye, jamme te mar jay." "Remember the One which permeates water, earth and everywhere. Why remember anything else which takes birth and dies? One Name permeates all the creatures living on earth and in water. We should remember that one Name. All other names begin when we utter them and come to an end when we stop. All these names, which are spoken or uttered by mouth, are given by us, whereas the natural Name is one for all. To remember the Holy Name of God is the only essence in this world. That Name was one in the beginning, now also it is one and after the creation comes to an end, it will remain the same. That 'Name' is true since time immemorial. All other names given by people are false. 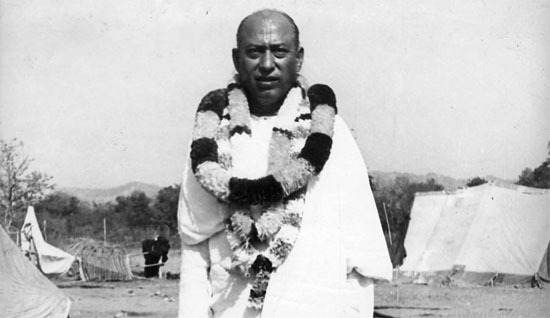 All incarnations, Masters, Saints and devotees who came into this world, imparted the Knowledge of the True Name and Divine Light to sincere seekers, but this world is such that people ignore the present divine Masters and after they are gone, celebrate their birthdays without knowing the depths of Spiritual Knowledge, and think that this is all that has to be done for salvation. They are not concerned in the least with what our great Incarnations talked about and taught the devotees of their time. "Man murid sansar hai. Guru murid koi sadh. Jo jane guru vachan ko, taka mata agadh." "Everyone in this world is disciple of his mind. Only a rare saint is a disciple of the Spiritual Master. Those who know the Word of the Master, realise the Divine Knowledge." Those who have not taken shelter in the Spiritual Master neither know, nor meditate and are not devotees. The Spiritual Master is God in human form. He dispels all the grief of his devotees, so that is why he is known as 'Hari" (the one who vanquishes). His Word dispels ignorance, in the same way as sunbeams dispel the darkness of night. However, night again prevails over daylight. Spiritual Knowledge doesn't mean that after initiation, ignorance may never again prevail. The darkness of desires is removed only when a disciple follows the instructions of the Master - in other words, when a disciple constantly remembers the Holy Name of God, which is present within everyone, with unflinching faith and reverence. "Uthat baithat sowat jagat nam. Kahe Nanak siddha bhaye tinha ke kam." Guru Nanak Dev Ji says that, if a person remembers the Name continuously while standing up, sitting, sleeping and awakening, all his actions are crowned with success. The Name, which can be remembered continuously while sleeping and dreaming, is the 'Word' of the Master. All other names and mantras are false. Do not waste your rare human body in these false things. How will you turn the beads of a rosary or sing devotional songs while you are asleep? You should know the indivisible 'kirtan' (sacred harmony) which is going on incessantly within you already. Keep firm faith in the Name and remember it as much as possible. If your faith wavers in a year, or two years or even after ten or twenty years, then how can it be 'unflinching faith? Faith should be unflinching forever, even if the sun rises in the west instead of in the east. Only when you have this much faith in the Master will you be called a 'devotee'. Everyone wants God to remove all his troubles and miseries like Lord Krishna did for Sudama, but they do not want to do anything for that and think that their names should be included in the list of devotees. Thirst is not quenched without drinking water, and only by devotion and service is one a 'devotee' or a 'sewak' (servant). The soul is very subtle. Reason and mind cannot reach there. One cannot get to it even by much reading and writing of the scriptures. Many say, 'Aham Brahmasmi' (I am God) and 'Ayamatma' (I am soul). We pronounce vedic mantras parrot-like, without understanding their meaning and think that we are spiritual. Many people waste their valuable time following such teachers blindly. They do not even contemplate that whatever they utter by mouth and repeat uttering is just to fill their belly. They will talk pompously about soul but if you ask them if they have realized soul, they will say, 'It is very difficult to know soul. Nobody can know it.' They will never say straight that they do not know Soul. It is written in the Ramayana, "Nar tan sam nahin kawanehu dehi. Jeev charachar yachat jehi. Narak swarg apwarg naseni. Gyan vairag bhakti sukh deni." There is no other species like the human body and a soul ever strives to get it. It is a ladder to either heaven or hell. In this body one can acquire the Spiritual Knowledge and thus achieve devotion and renunciation. People make a ladder with bamboo and nails to reach a rooftop. We climb it step by step and reach the roof easily. Other species like elephants, lions, dogs, and donkeys do not make ladders. Similarly, God did not give wings to human beings but they used their intelligence to invent and manufacture aeroplanes. Now they can fly much faster than birds and cover a distance of thousands of miles in a short time. But the soul is subtler than even the sky. If we don't know it while we are human beings then in no other species can we know it. When other creatures cannot even build a ladder, how can they uplift their mind to the heavenly abode of the Almighty? Our surati (attention) has descended from this level to the material world. We have to, in this very life by regular practice, elevate our mind back to the heavenly abode. Unless our surati regains its original plane we cannot get salvation and hence we cannot be happy and contented. The Muslims believe that 'Khuda' (God) is in the 'Seventh Sky'. But we should wonder what this means. Hindu people also believe that there are 14 lokas (levels of existence) and in our physical body too there are 14 chakras. The midpoint between the eyebrows is called 'Agya chakra': there are 7 chakras below this and 6 chakras above it. The chakras from 'Agya chakra' upwards are known as the 'seven skies' or 'seven lokas'. We have to take our mind above even there. In primary schools the letters of the alphabet are displayed in bold pictures. We see them, but we don't know anything about them until the teacher tells us how to form and pronounce them. So how can we know the Holy Name of God which is within us? A kite alone cannot fly in the sky on its own and neither can its string. If we throw these up individually, they will fall down. But when the kite is attached to the thread with a knot, then both go up without falling down. Similarly, there are two ways to uplift the mind: Divine Light and unstruck celestial sound (nad). 'Surati' and 'Shabda' ('Word') are bound with a knot by the Master. Word is within and 'Surati' is also within, but unless both are bound with a knot by the Master the Surati cannot rise. When you meet a true Spiritual Master, he joins your surati with the Word instantly. Unless we meditate on the form of the Master, our inner knot will not be firm. The form of the Master manifests within. The divine vision of the sincere devotee is opened by meditating upon the Master's form. "Shri guru pad nakh mani gan jyoti. Sumirat divya drishti hiya hoti. Sujhahin Ram charit mani manik. Gupta pragat jahan jo jehi khanik. ": By meditating upon the Master's form, the divine vision is opened. Such people are called the 'loved ones' or devotees. The Master imparts the knowledge of Word, unstruck celestial sound and Divine Light to all seekers who come into his shelter and surrender. By attending satsang our body remains there for some time and some service will be done there. Also, if one gives money in service out of reverence, then his mind also remembers the Master. Then one will be able to meditate. But meditation also needs service and satsang. So don't live in ignorance. Get Spiritual Knowledge from the present Spiritual Master, meditate and remember the Holy Name of God. downloaded from http://www.manavdharam.org/books_mags/online_magazines/md/2008/July_08/hansji1.html on 1st April, 2009.